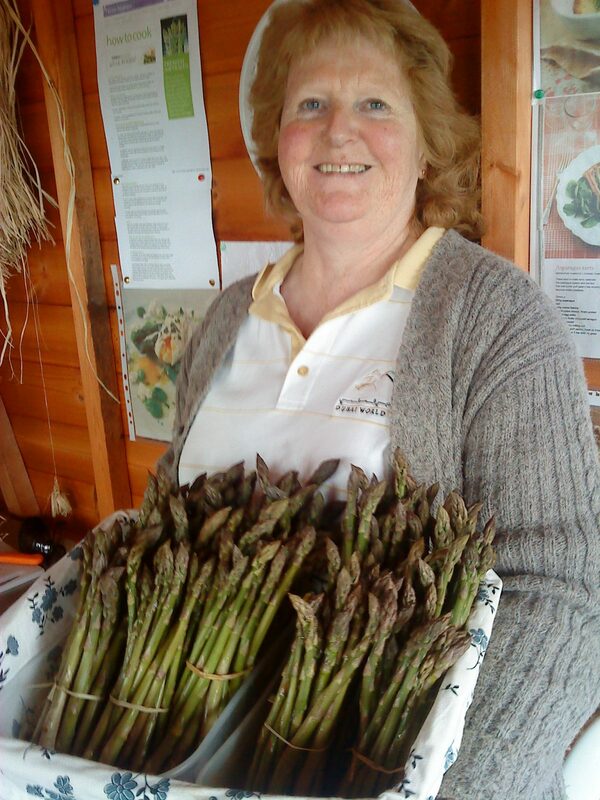 The Cornish asparagus in our veg boxes comes from Gill and Roger Derryman at Lower Croan, Sladesbridge near Wadebridge. It’s a busy life on their mixed farm beef and cereal farm. The Derrymans produce prime organic beef from their suckler cows. Most of the cereals grown are fed back to the cattle. They have five acres of asparagus they sell at the farm gate and to local retailers over six to eight weeks in May and early June. It’s a very time-consuming and labour-intensive crop. At this time of year Roger is out cutting the asparagus spears daily from 7am so Gill (pictured) can start selling them from 10am onwards. As everything is so late this year, we can look forward to having this very seasonal vegetable in our boxes until about mid-June. Gill has lots of recipe ideas for asparagus, but this is her favourite as it’s so easy. It makes a light lunch dish with new potatoes, or a simple starter. Fry the chopped bacon in the butter or oil until crisp. Meanwhile, snap off the ends of the asparagus stems and steam the spears upright for no longer than five minutes. Place them on a warmed dish, top with the crispy bacon and sprinkle with parmesan shavings. Serve with Cornish new potatoes.